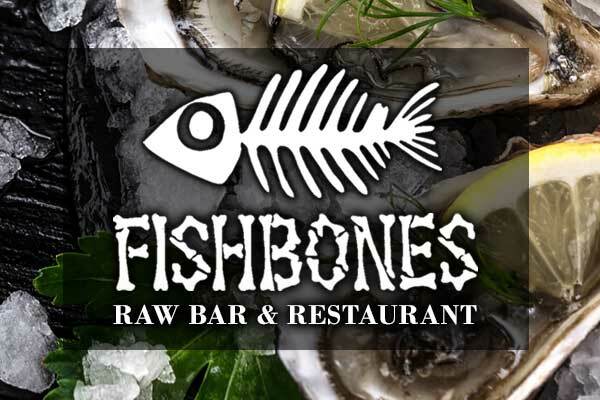 Monday through Sunday, 11 a.m.-12 a.m.
Fishbones Raw Bar and Restaurant in the Outer Banks has been Duck, NC's original raw bar and Caribbean inspired restaurant since 1995! In 2016, we completed a total renovation which creates a fun, casual atmosphere! Our new innovative menu features Caribbean style cuisine combined with fresh Outer Banks Seafood. Don't miss out on Fishbones' award winning clam chowder or favorites such as our raw bar items, fried seafood baskets, wings, coconut shrimp and specialty drinks served in souvenir cups. Fishbones Raw Bar and Restaurant also features multiple TV's for the sport lover and night time fun with live music and karaoke singalongs! Fishbones is located in the Scarborough Lane Shoppes, located in the town center of Duck. Be sure to check out our 375 seat waterfront sister restaurant, Sunset Grille and Raw Bar, 3/4 mile North of Fishbones on Duck Road.